A very exotic and attractive combination specimen from a little known locale. 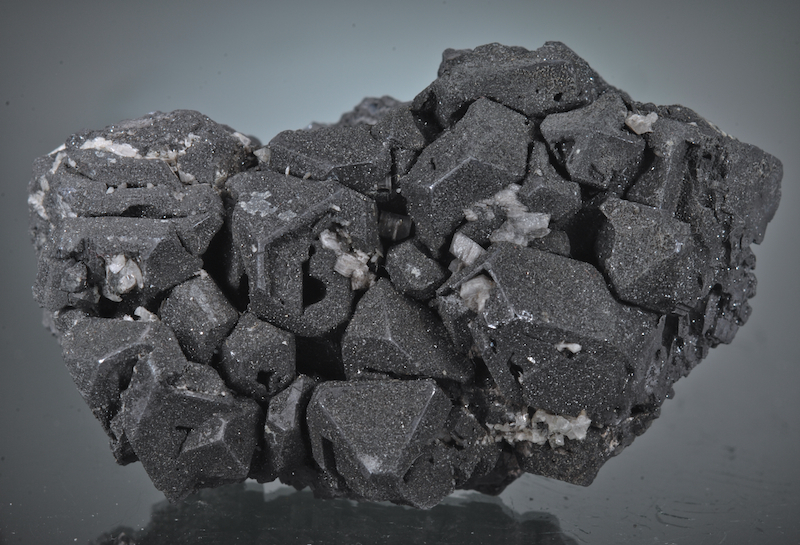 The Galena is well crystallized in several habits including hoppered Octahedrons, Spinel twins etc. These are covered with micro crystals of secondary minerals (Cerussites, Sphalerites etc) the small area of matrix is a fine grained green Danburite, and there are several areas of white crystallized Nordenskioldine with some unidentified things as well. In excellent condition, while this may be a "dark ugly" to some it is mineralogically rich and has great 3 dimensional form. Choice. A perfect, top notch Pyromorphite with killer form, top color and luster. This came out of the ground in 2000 one of the first and best ever finds at Daoping. This locality is now rightly regarded as perhaps the best source ever of Pyros worldwide. This top quality and rich color is no longer found and rarely available. A modern classic, damage free with sizable crystals, this is a fine competition grade miniature. 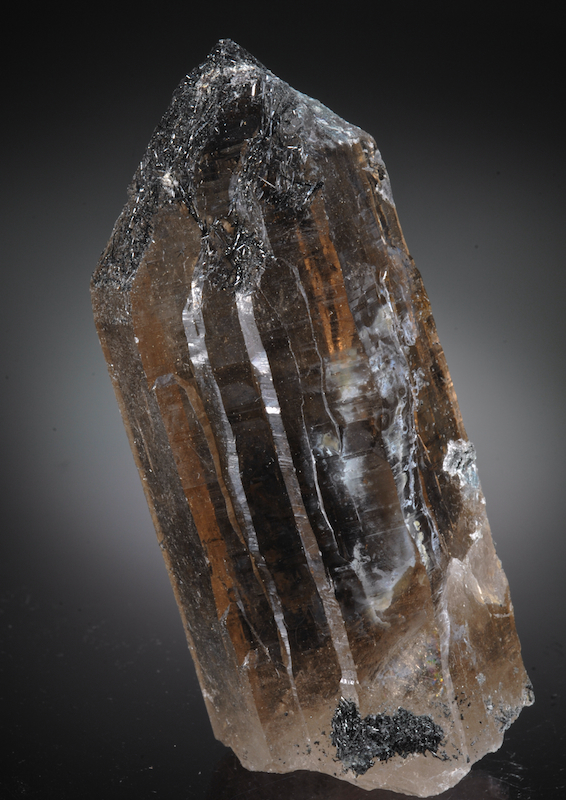 A large gem clear Quartz that is a light smoke brown with coatings and inclusions of Schorl Tourmaline. Complex multi faced sides with ramparts make this a statuesque crystal. In excellent condition the overall look is an alpine type habit. In exceptional undamaged condition a few areas show a coating of Hyalite opal as well. Especially fine and choice for the locale this is far better in person. 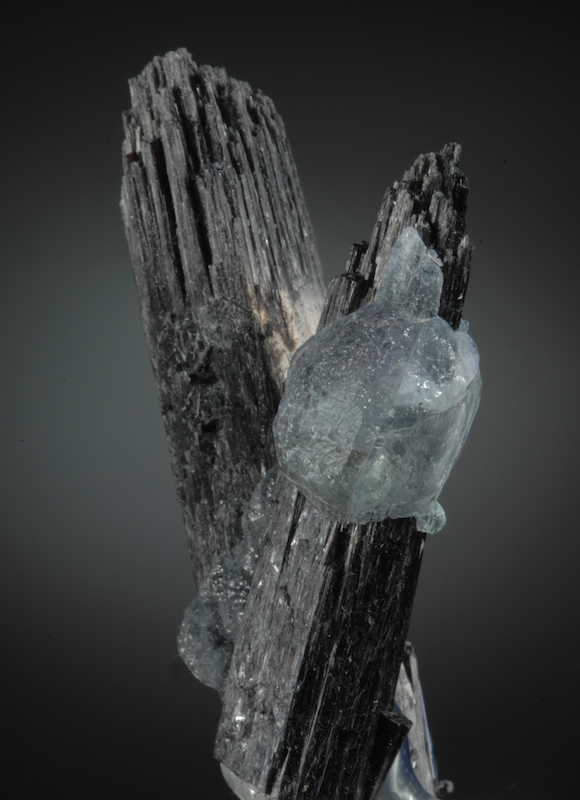 A pair of Tourmaline crystals decorated with several globular Fluorites. 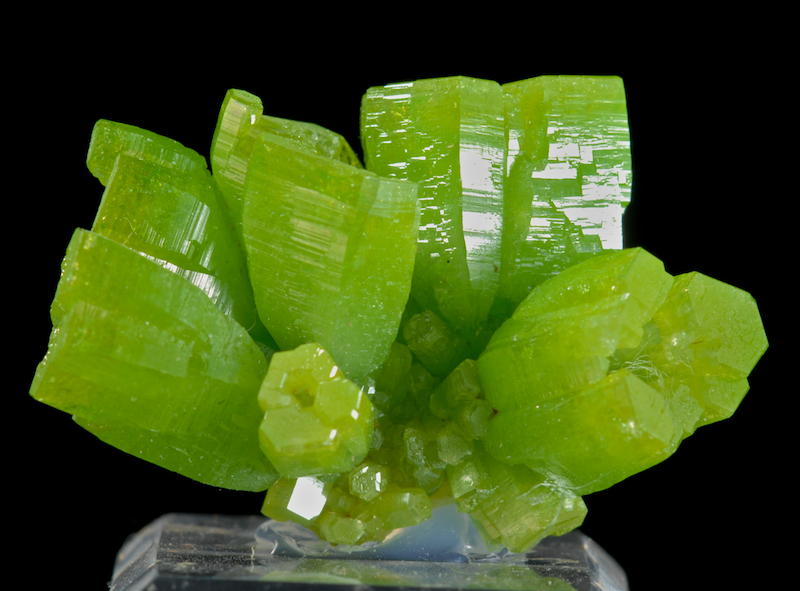 The Fluorites are included by hairlike Tourmalines that are a light green hue. From The slopes of the Hohenstein Massif in the Erongo, this is a likely a mixture of green Elbaite and Black Schorl Tourmaline. A very unusual arrangement and a nice setting for the transparent Fluorites. An extra bright red Quartz from the Orange River. The top half is transparent and the included Hematite makes a slightly zoned look. A tiny tip chatter is just visible and so the price is a lot lower than if it was not there. 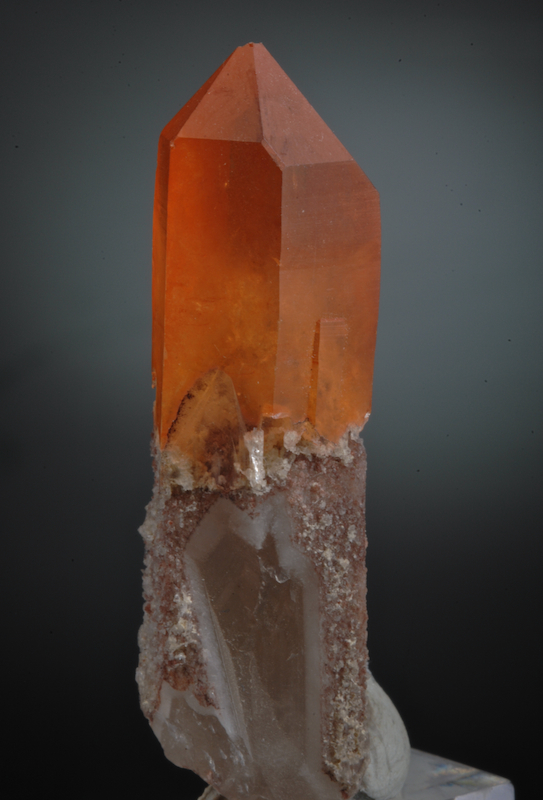 Good Orange River Quartz has not been found for a few years now and can be very expensive when they turn up. A colorful specimen with eye appeal. 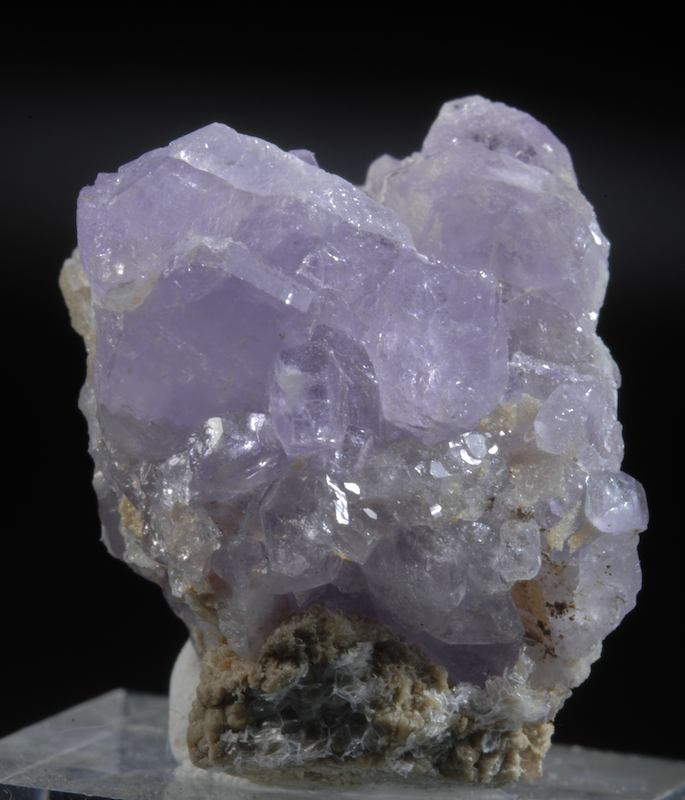 An old, somewhat crude cluster of small colorless and larger purple Apatite crystals. The biggest Apatite is 1.8 CM across which is the largest I know of for the locale. From the Mount Rubellite Quarries an old but less famous Maine location for Apatites. Some chipping, crude edges and contacts are noted but the color, huge crystal size and low price help compensate for imperfections. 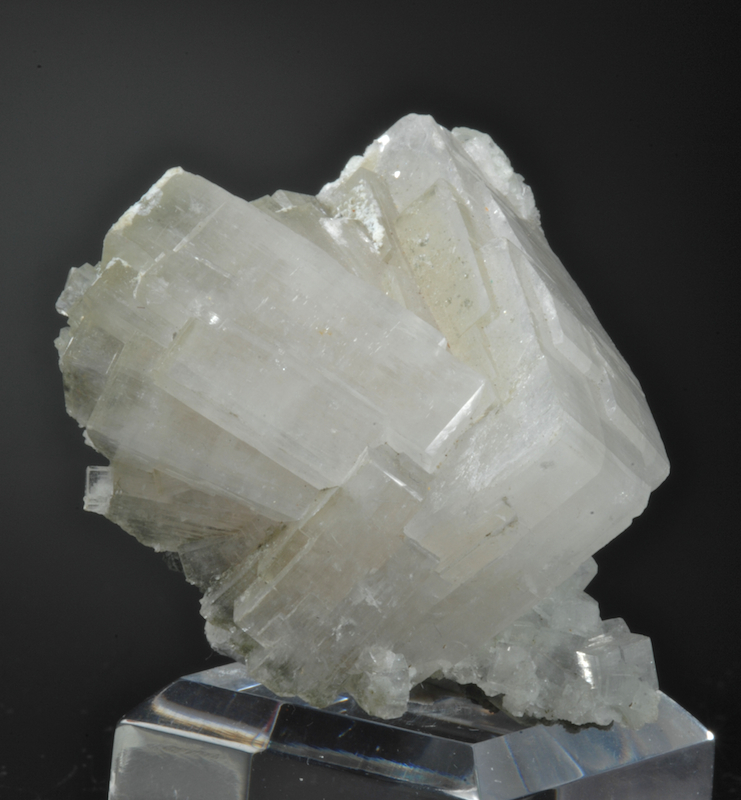 A rosette like cluster of flat blocky style Apophyllite crystals to 4.5 CM diameter. Glassy and lustroust with pleasing form and in fine condition from an old collection, this is pre 1950 but likely much older. Classic style and locality, this is a choice, esthetic example. 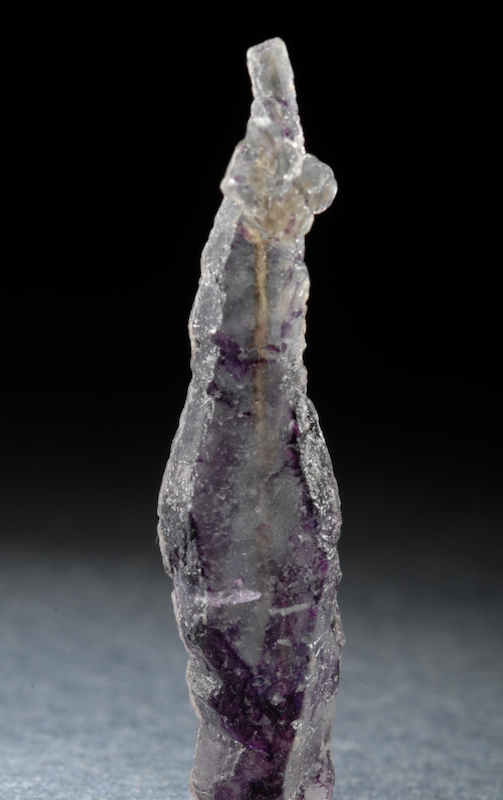 A very odd, elongated spinel twin chain of etched Fluorite. Colorless with some purple zoning and a single internal orange thread probably a central channel. From a small series of pockets found in 2015 on Hohenstien in the Erongo region of Namibia. This find stands out as a unique, bizarre and oddly esthetic series of sculptural Fluorites. In undamaged condition, displays well on all sides, a very special specimen with a distinctive habit just not known from any other discovery.